As organizations seek to maximize efficiencies, the adoption and implementation of virtualization has sky rocketed. Providing technical solutions in a structured and cost-effective manner remains a key priority for many organizations and is changing the way IT professionals both work and recruit. This webcast with guest speakers Simon Gerhardt – Production Services Director and Jonathan Pearson – Business Development Manager at Hays IT will highlight how working in virtualized or cloud environments brings new resourcing challenges for employers as the skill set required of IT professionals evolves. A veteran of many virtualization projects and successful IaaS outsourcing deals, Simon will use Hays plc (employing 6,000 staff world-wide and now operating at 80% virtualization of their infrastructure estate) as a case study. 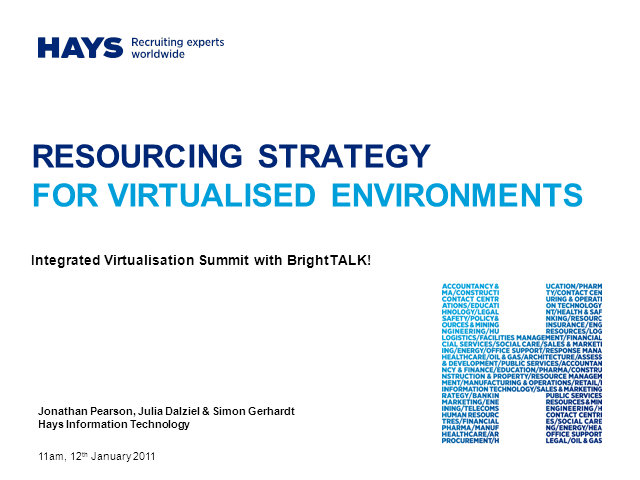 Simon will discuss the virtualization resourcing challenges Hays faced providing key learnings for your recruitment strategy. Jonathan will also provide results from a recent Hays survey on current virtualization trends which are having a profound effect on permanent/contractor recruitment decisions and external outsourcing options. By attending this webcast you will qualify for a complimentary ‘Proof of Concept’ with one of our virtualization IT partners who best fits your technical and strategic direction.